When the four young ladies of the Quartet New Generation start off once again on fantastic voyages of discovery throughout musical history on their second GENUIN CD, one hears recorders in a perfection that makes one's breath (the listener's, that is) stand still… daredevil cross connections, bridges over centuries, paradoxical symmetries – from Handel to Childs, from Blecharz to Bach. The most widely varied fugues, fugati, canons and other beelines waft away from the loudspeakers as one listens to the ethereal sounds whilst speechlessly agape. 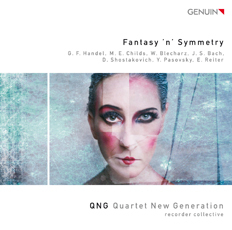 Fantasy `n` Symmetry: chamber music of the topmost class!